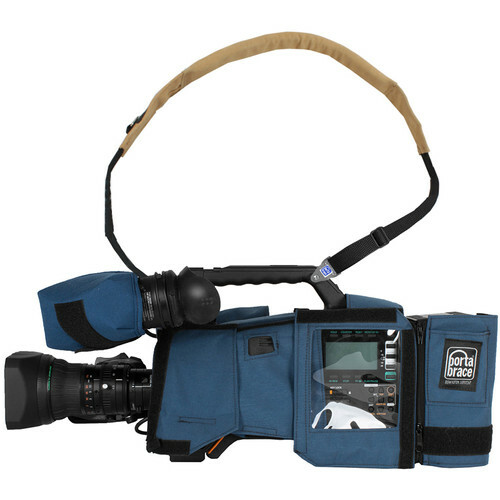 This blue CBA-HPX600 Camera BodyArmor for Panasonic AG-HPX600 from Porta Brace offers custom-built protection for the AG-HPX600 camcorder. The water-resistant BodyArmor is constructed from durable 1000D Cordura, and fastens around the camera using hook-and-look fasteners and a zipper. Cutouts and a vinyl window enable you to maintain access to the camera's controls. The snug fit of the BodyArmor enables secure handling of the camcorder. The cover's back end expands to accommodate various battery and wireless microphone combinations. The Camera BodyArmor covers include a reversible, waterproof Rain Top that is white (reflective) on one side, for shooting in the sun, and black on the other side for protection against rain and dust. The padded interior of this cover is lined with breathable mesh, maximizing airflow between the cover and camera. Securely carry your camera using the BodyArmor's removable, padded suede shoulder strap. Box Dimensions (LxWxH) 18.6 x 9.2 x 4.8"